In Greening China: The Benefits of Trade and Foreign Direct Investment, Ka Zeng and Joshua Eastin explore the influence of international economic integration on the environment in China. Their results surprised Zeng, who had not expected to see such a strong beneficial effect of trade and foreign direct investment. However, not all foreign trade or direct investment has an equal impact. It matters who the trading partner is and where the foreign direct investment originates. “Chinese provinces that either export to or receive most of their foreign investment from countries with more stringent environmental standards are also more likely to exhibit superior environmental performance,” Zeng and Eastin wrote. 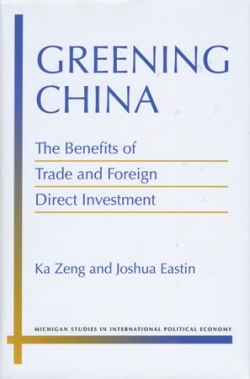 Greening China: the Benefits of Trade and Foreign Direct Investment is published by the University of Michigan Press as part of the series Michigan Studies in International Political Economy.